What is the Difference between Ephedrine and Ephedra? • Categorized under Drugs,Health | What is the Difference between Ephedrine and Ephedra? Ephedrine, a decongestant and bronchodilator, is most commonly found as a white, odorless crystalline powder. It is usually administered orally or by injection, and is used to treat, and assist in, regulating various conditions such as through the following: increasing norepinephrine levels, increasing blood pressure, reduce nasal congestion, relieving shortness of breath, and reducing swelling and chest tightness. Ephedrine allows one to breathe more easily, as it acts as a central nervous system (CNS) stimulant. However, it is also used illegally as performance enhancers for certain sports and for weight loss – although, this is not recommended without seeking professional medical advice. At present, it is not prescribed often due to both the existence of safer alternatives, and medical professionals disapproving of its use and wide distribution. It can be found as an active ingredient in Ephedra. Nausea, tremors, loss of appetite, vomiting, headache, dizziness, or fever. Cardiac arrhythmias, allergic reaction, difficulty urinating, rashes and swelling of the mouth, seizures, palpitations, high blood pressure, or death. Vertigo, headache, anorexia, insomnia, sweating, nervousness, or neurological damage. Ephedrine injections should be taken only when prescribed by a doctor for the individual’s condition(s). It can be taken with or without food, and should be used strictly according to the medical practitioner’s instructions. Overdose should be avoided, as it can prove to be fatal. Oral ephedrine, however, does not require a prescription in some countries. Nevertheless, the instructions on the container/package should be followed to avoid serious side effects, or overdose. It is important to note that ephedrine should not be used in combination with other drugs. Ephedrine, also known as L-Ephedrine, is a phenethylamine with a molecular formula of C10H15NO. Its molecular weight is 165.236 g/mol, and has a boiling point of approximately 260 degrees Celsius. It is soluble in water, oils, ethanol, and chloroform with 1g of ephedrine dissolving per 20mL of water. It is an alkaloid with a pH of around 10.8, and is similar in structure to the derivatives of an amphetamine. 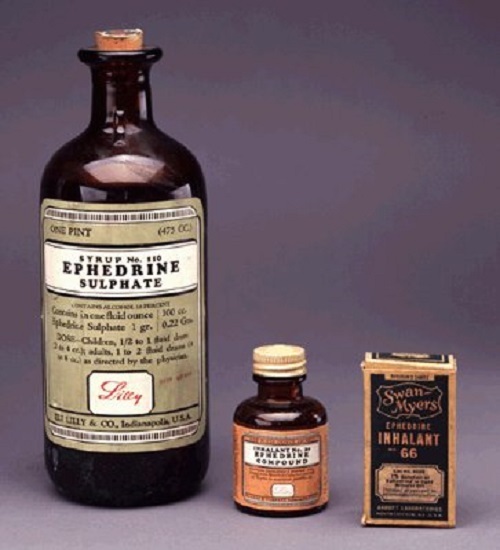 Ephedrine is mostly eliminated by urine, with a half-life of around 3 hours. Furthermore, important chemical precautions must be taken as it is harm if swallowed. Dangers include: the possibility of organ damage through repeated or prolonged exposure, or damage to fertility or an unborn child. Ephedra, besides being known as a medical preparation or drug sold by healthcare providers, is a genus of plants used mostly for their active compound ephedrine. Ephedra nevadensis (Mormon tea) and Ephedra sinica are the most commonly used ephedra species, but the latter is often sold illegally since it is banned in the United States. However, Ephedra sinica is the only species that contains ephedrine, and also pseudoephedrine. It is used for weight loss, enhancing athletic performance, allergies, and as a water pill to increase urination frequency. Consequently, the US Food and Drug Administration (FDA) has banned the use of ephedra as athletes gain an unfair advantage from the effects of the ephedrine. Also known as ma huang in China, ephedra branches and tops are usually made into the medicine sold, and only as generics. It is also, however, combined with other substances, such as caffeine, making it more effective yet more dangerous to use. Although it is an herbal product, it has many side effects. Dizziness, anxiety, nausea, vomiting, high blood pressure, loss of appetite, psychosis, tremors, or dry mouth. Diabetes, heart disease, kidney disease, glaucoma, seizures, stroke, mental illness, thyroid disease, or death. The recommended dose should never be exceeded. Overdose may cause life-threatening consequences. It is not recommended for use by children, or the elderly. Pregnant women should avoid using ephedra as this may cause harm to the unborn child, or the mother. Certain preparations, such as liquid ephedra, may contain sugars. This should be avoided by people with diabetes. Do not use with other medications without first checking with a medical professional. Always seek advice from your doctor or pharmacist before using ephedra. It is generally considered to be a danger to human health, regardless of use. Safer, FDA-approved, alternatives exist. Do not perform tasks that might place you in danger, such as driving or operating machinery, as ephedra may cause dizziness. Never take ephedra with alcohol since this increases the severity of common side effects. Quinidine, disopyramide, amiodarone, sotalol, dofetilide, and ibutilide. Methylxanthines should also be avoided when using ephedra. Both are stimulants, and, therefore, may lead to nervousness, high blood pressure, anxiety, and jitteriness. The stimulants work together, causing increasingly severe symptoms that may last longer. Other stimulants, also, affect the severity of certain side effects, such as faster heartbeat. Dexamethasone interacts moderately with ephedra. The effects of ephedra slow and weaken the activity of dexamethasone. This may lead to secondary consequences by the decreased effectiveness of medication. Effects of depression medications, such as phenelzine, may be increased when used with ephedra. Faster heartbeat, nervousness, and high blood pressure are all side effects of depression medications and ephedra, and risk/severity could, therefore, be increased drastically. Insulin, glipizide, chlorpropamide, glimepiride, glyburide, and tolbutamide. When used in combination with ephedra, there is moderate interaction with seizure medications. Ephedra affects chemical balances in the brain, and since seizure medications also alters brain chemistry, this may influence the effectiveness of the seizure medications. Ephedrine is a phenethylamine, an active compound present in the plant species Ephedra sinica. It is toxic when consumed, and does harm to the human body. Due to its resulting effects inside the human body, it may contribute to weight loss and relieving asthma-like symptoms. However, prolonged use may be dangerous as the side effects of ephedrine are often severe and life threatening. Ephedrine is identified by its white, fine, crystalline appearance, and is soluble in water. For these reasons, it is also easy to consume. Since it assists in increasing norepinephrine levels, allowing easier breathing, and affecting heart rate and general physical response, it is banned by several major sports organizations. Ephedra is a medical preparation of plants from the species Ephedra sinica, typically for consumption. It contains the active compound ephedrine, along with pseudoephedrine, and other stimulants, such as caffeine. It is extremely dangerous to an individual’s health, and is therefore banned in the United States. It is used for similar reasons as the chemical ephedrine, since it contains it, but is thought to be more effective – due to its combination with other stimulants. Since it is a combination of potent stimulants, it results in more severe adverse side effects in the human body compared to pure ephedrine. It should not be used in combination with other drugs, and only under prescription from a medical professional. Always seek medical advice while following the instructions on, or inside, the package and the direction of the healthcare providers, before considering the use of ephedra. Luke Potgieter. "What is the Difference between Ephedrine and Ephedra?." DifferenceBetween.net. December 28, 2016 < http://www.differencebetween.net/science/health/what-is-the-difference-between-ephedrine-and-ephedra/ >.